I went out with the cholera guys the other day. The cholera treatment centre is just around the corner from our hospital. Cholera is endemic to this area, with outbreaks from time to time becoming a normal occurrence. But this one is very serious in terms of time and geographical extension. The bacteria that causes the violent diarrhoea can survive several days in food and water and cannot be killed by refrigeration or freezing. Chlorine, in the right mix and quantity, however, is effective. The solution to a cholera epidemic is not only medical, but also includes a large logistics component. Isolation of cases, identifying contaminated sources (such as sewage, dirty water or rubbish), decontamination of those and a general clean-up will mostly lead the outbreak to finish quickly. Once you are sick, the main strategy is getting you quickly to a treatment centre where the solution will be rehydration. There is no specific medication for the cholera bacteria itself. The most severe cases may have to stay in the centre for a couple of nights, receiving intravenous fluids and electrolytes, while mild cases will only need oral rehydration salts dissolved in water, and can mostly go home within the day. 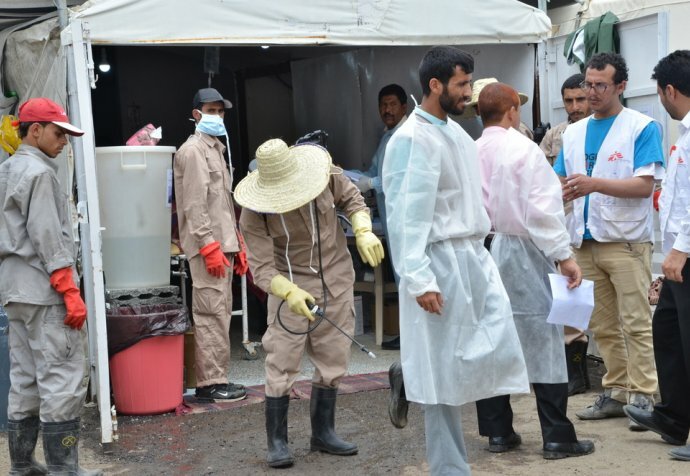 "The bacteria that causes the violent diarrhoea can survive several days in food and water and cannot be killed by refrigeration or freezing"
This particular outbreak has manifested itself in 19 of Yemen’s 22 provinces. While the numbers were higher in the northern part of the country, it is now the south that is most affected. Our centre has been receiving 180 to 200 patients a day for the last couple of weeks. Now the numbers seem to have stabilised at around 150, so we are hoping that the peak is behind us. For a centre of 70 beds, this is still a lot! The cholera centre we are supporting in Aden is staffed by Ministry of Health nurses and doctors, while our support is mostly logistic. We have put electricity and water into the centre, started a chlorination regime, given some medical supplies, and of course trained the people on what to do. We have a doctor, four nurses and four technicians from MSF dedicated to the cholera centre. Now that this first supported centre is up and running, our water and sanitation specialist is moving on to northern Yemen to help our colleagues there. "The centre is composed of “rooms” set around a covered internal courtyard. We have beds in every available corner, as well as people on the floor in corridors and rooms." The centre is composed of “rooms” set around a covered internal courtyard. We have beds in every available corner, as well as people on the floor in corridors and rooms. People here are used to receiving medicines for any ailment, and cannot really understand why we are not giving any out (except the rehydration salts). When some people do get pills because of other concomitant conditions or because of the severity of their case, then the pharmacist has a riot on his hands – why him and not me? Emergencies such as an outbreak are managed by MSF’s ‘emergency cell’. This is an internal way of acting faster and with less restrictions than normal. Funds are made available overnight, people are on flights immediately and the logistic machine gets in motion. As MSF logistics operates on a system of “kits”, there is not much thinking required for the appropriate items to be put on a cargo plane and sent. In the case of a cholera outbreak, for example, the people on the ground call for the number of kits equivalent to the estimated case load. Every kit will contain all that is needed such as rehydration material, stands for the drips, butterflies to put into veins, tape to stick them on, chlorine, buckets, taps, footbaths… you name it.